It’s talent show time at school, and eight-year-old Jasmine Toguchi is excited to show her stuff. But as she thinks about her strengths—tree-climbing, mochi making, collage—none of them feel quite right to perform on-stage. Jasmine’s friends already have a talent: Tommy yo-yo’s, Daisy dances, and Linnie plays piano. Plus, Maggie Milsap (aka Miss Perfect) is saying she'll have the best talent. 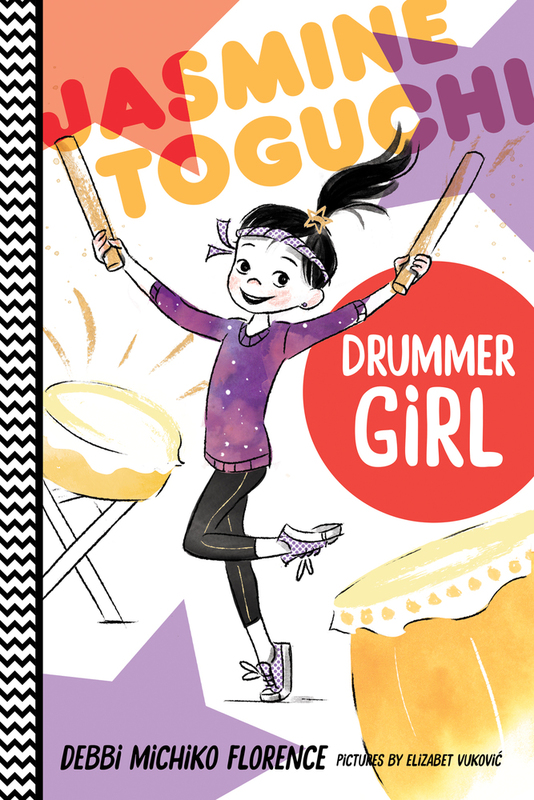 When Jasmine’s mom introduces her to the taiko, a traditional Japanese drum, Jasmine finally finds an activity that feels just right. But will she be good enough at taiko in time to beat Maggie Milsap? Join Jasmine as she discovers her talent—and the difference between being the best and trying your best. Ms. Sanchez, my third-grade teacher, played the start-of-the-day song on her xylophone. Everyone in room 5, including me, sat up straight at their desk and got quiet. Debbi Michiko Florence is a third generation Japanese American, and has many fond memories of her family's traditions and growing up in California. Debbi now lives in Connecticut with her husband and their two ducks, Darcy and Lizzie. Debbi and Elizabet are the author and illustrator of the Jasmine Toguchi series, including Jasmine Toguchi, Drummer Girl, Jasmine Toguchi, Super Sleuth, and Jasmine Toguchi, Mochi Queen.